Willow (wicker) eco-coffins. Traditional and round-ended designs. Willow Coffins (also known as wicker or basket coffins) in either traditional coffin shape (angular and tapered) or they have round ends. Willow coffins also have a variety of shapes of handles. Some coffins can even have a band of a bright colour. Some also have slightly curvy shape like the eco pod coffin below. We have a number of different styles and colours of willow coffin available. to anyone in the UK to buy for quick delivery. We have an even large selection available if we are your chosen funeral director. Willow coffins are also known as basket coffins or wicker coffins. They have become popular again lately but are by no means a new idea. In the late 19th century Sir Frances Haden developed wicker coffins. His design had no lid and was to be filled with flowers or earth for natural burial. Willow is a truly environmentally renewable resource. The willow plant grows up to 8ft in height and can be harvested annually from the same crown for up to 60 years. Some of these beautiful wicker coffins are hand crafted by co-operative of cottage industries in Poland. Some are woven in Somerset. 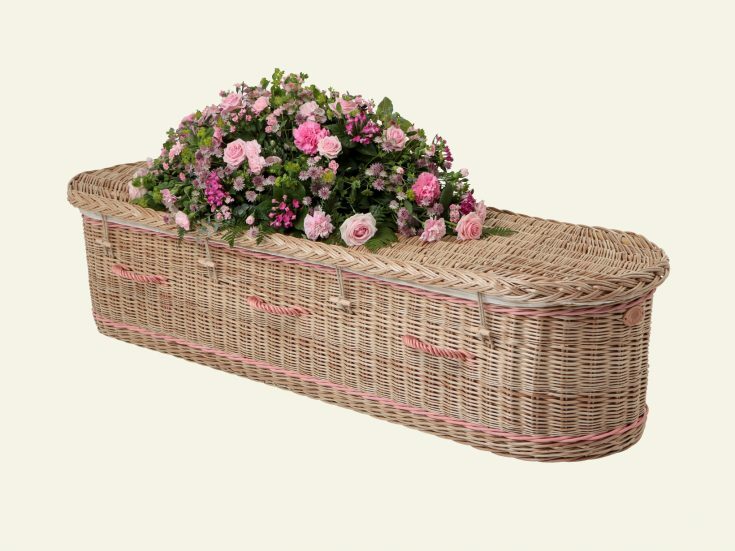 Willow basket coffins can look even lovelier with the addition of flowers. Because they are woven it is easy to attach flowers to a willow coffin. 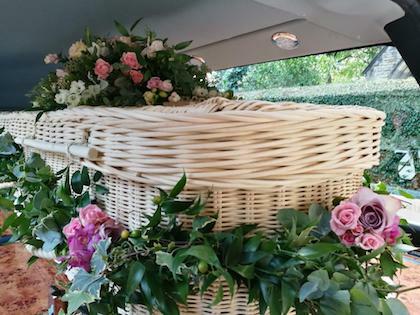 As well as the flower arrangement on the top of the coffin often a garland can be attached around the coffin and individual posies too. More information on how to decorate a willow coffin. Willow coffins can be supplied in any colour. Or with a coloured band. 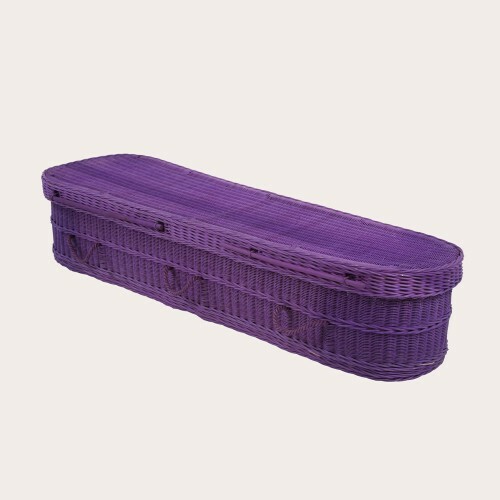 Below are a rainbow willow coffin and a solid purple coffin. Our willow coffins are FFMA or CCSA approved for quality. All our eco-coffins are suitable for traditional or green burial or green cremation. These willow coffins are made from sustainable resources; they are 100% natural and biodegradable. They are very strong and tested to bear heavy loads.